Elon Musk has planned a special trip around the moon using his Big Falcon Rocket. Read on to learn more about this special lunar mission. We know Elon Musk from his famous Space X Falcon 9. Its heavy boosters made history in 2018 for successfully landing back on Earth after launching the Falcon Heavy Rocket. Aside from working on his Tesla cars, Elon has other plans for an upcoming moon adventure. As easy as what Jackie Gleason made it sound to send Alice to the Moon during episodes of the Honeymooners, Elon Musk has a harder task before him. 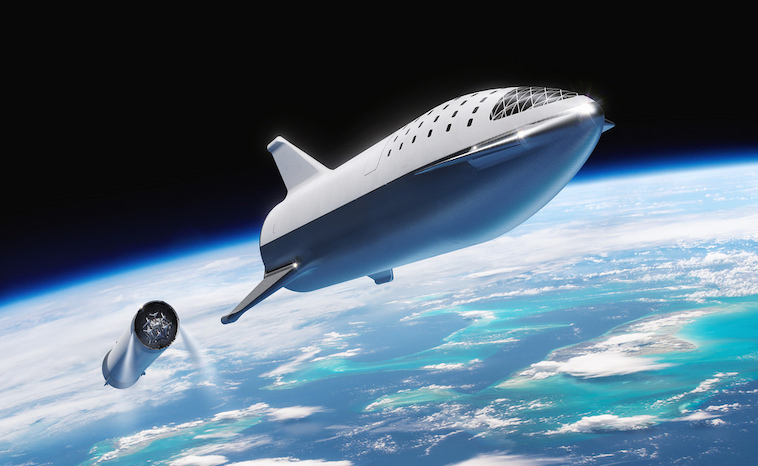 Space X plans to send a Japanese billionaire Yusaku Maezawa and seven of his friends around the moon in 2023. Why now? Why have we not sent men to the moon since the 1970s? From reading several articles, it seems that aside from lack of interest, NASA wanted to fund other projects. In addition, they needed the resources to start the Space Shuttle program and then later the International Space Station. Recently, the Chinese have expressed interest in the moon and placed Chang’e four space probe on the surface in January of this year. How will Space X achieve this lunar mission? Space X plans to use their Big Falcon Rocket combined with the spacecraft called Starship to get Maezawa and his friends to the moon. The BFR will stand 387 feet (118 meters) tall when fully assembled. Furthermore, will be capable of flying up to 100 people and 100 tons (90 metric tons) of payload into space, Musk has said. (Space X, 2019) The trip to the moon and back would take about a week to complete. A couple of minutes after launch, the BFR booster will separate and head back to Earth. As with the Falcon Heavy rockets, it will use its fins and engines to steer it back to Earth. Eight minutes into the flight the BFR will use its fan-like solar panels to generate power for cruising around the moon and back. Two days into their trip the passengers will see the moon. In addition, the BFS will skim over the moon’s surface, offering fantastic views of lunar craters and other terrains. Two days and 21 hours into the Lunar BFR Mission, Maezawa and his fellow passengers will see Earthrise. Earthrise happens when you look at the Earth rising above the moon. Incidentally, this was first witnessed by NASA’s Apollo 8 astronauts in December 1968. Three days and 12 hours into the Lunar BFR Mission, they will start their journey back to Earth. Maezawa’s spacecraft will swing around the far side of the moon. At this point, the flight engineers will fire some or all of its seven Raptor engines. This will help make any course corrections needed to get back to Earth. At the five-day, 22-hour mark (according to SpaceX’s flight profile), the BFS will begin descending through Earth’s atmosphere, using its forward and aft wings to steer. The moving rear and forward wings will keep the spacecraft oriented correctly during re-entry. This part of the trip is quite dangerous because they have to enter just at the right time and angle. Will Elon Musk have his Big Falcon Rocket ready for 2023? We look forward to finding out about this mission and other missions from Space X in the coming years.